Lightglass Optics is where you can find the largest selection of Newport, Line Tool Company, OptoSigma, Thorlabs and other manufacturers of fine optomechanical equipment. By selling pre-owned equipment, Lightglass Optics can fill your Optical Research equipment needs at a substantial discount- saving those precious budget dollars. In addition, we have more Alignment Telescopes on our shelves than anybody else..anywhere!- currently over 100 - made by Keuffel and Esser (K&E), Brunson, Cubic Precision, Davidson Optronics, Engis, Taylor-Hobson and others. We also have supporting Optical Tooling to go with them. Just click on any line item to go to the page for that item. The Newport SL25.4BD Gimbal Optical Mount includes the Newport Differential Micrometers. This High-Stability Gimbal Mount is part of Newports SL series and will accept up to a 25.4mm diameter optical component. 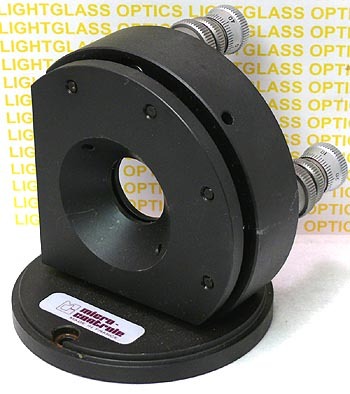 These are a true gimbal mount and offer high-resolution positioning in both azimuth and elevation, which makes them ideal positioners for critical positioning of mirrors and beamsplitters. The interior mounting location on this gimbal mount features a kinematic mount system. 3 precision balls locate the optic in the same exact plane time and time again. Please feel free to contact us at lightglass@aol.com with your questions concerning our inventory, or if there is any problem with this website. We accept phone orders and Purchase Orders from Universities and Research Organizations. Thank You for looking at our website! Copyright Lightglass Optics. All Rights Reserved. eCommerce Software by 3dcart. Copyright © Lightglass Optics -Surplus Newport Stages Mounts . All Rights Reserved.